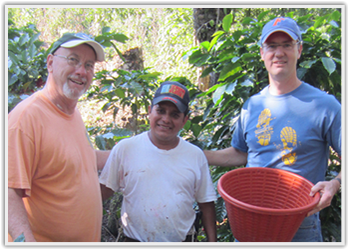 I traveled to Guatemala in December for a week, the goal of the week was to visit some of the coffee farmers, place some water filters in some of the homes and help fit eye glasses. Another project we are trying is to introduce hybrid corn in the area to increase production. The people have coffee for their cash crop and corn to eat, if we can help them find access to a better hybrid then their lives will be improved greatly. The week was very successful, we helped 25 homes have pure water and brought 200 pairs of glasses to the area. They will be available at a clinic at cost to the patients. The coffee crop is weaker than last year and prices are alot lower, to add to this many of the farmers are having a hard time with a fungus that greatly affects the plants. Our paying more than fair trade and guaranteeing a market to the farmers greatly aids them and we need to find a way to help with the fungus. The corn is being tested with 2 farmers and hopefully will improve their crop. I always enjoy being around these fantastic people, they are very outgoing and I look forward to being with them each year.